I’m feeling a little more clear-headed at the moment — not as fuzzy-brained as before. Well, there’s the slight matter of my ongoing cough and congestion, so I’m not quite all the way there, but I can think more easily than I did last week. Cycling through different mental states (normal, squirrel, fuzzy, etc.) 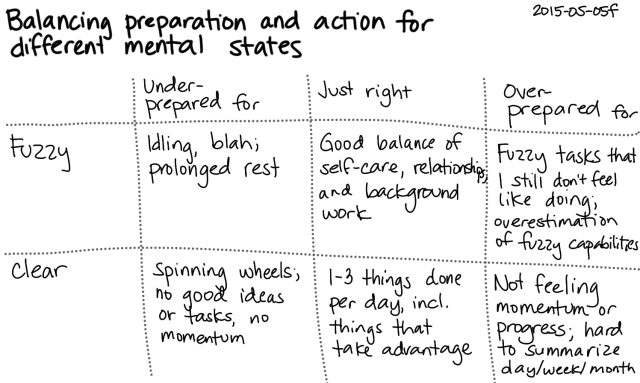 in quick succession has been helping me get better at differentiating among them, and I’ve been thinking about how I can make the most of them. In particular, I’ve been thinking about the consequences of considering one or the other as my “default” state, or of getting rid of the notion of a default state altogether. 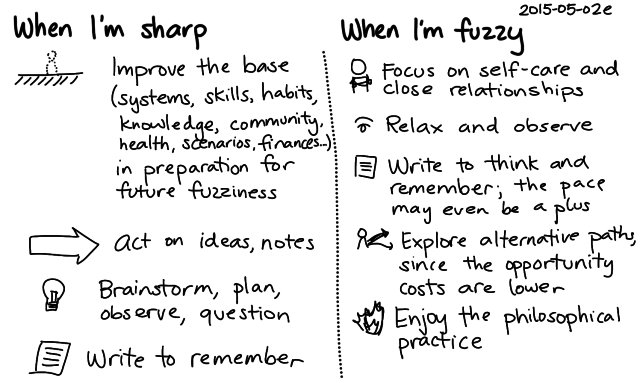 If I think of clarity as my normal state and fuzziness as a short interruption, then when I’m sharp, it makes sense to make the most of it, and when I’m fuzzy, it makes sense to do the background work that will help me make the most of my next sharp period. 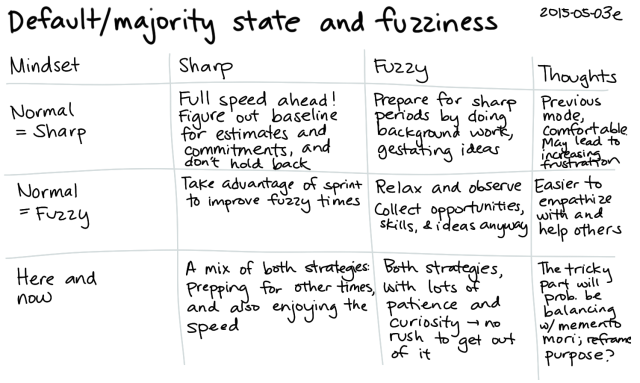 If I think of fuzziness as my normal state and clarity as a gift, then when I’m clear, it makes sense to invest a lot into building the systems, habits, and skills that would make fuzzy times even better. I’m not sure how probable this is, but I’m leaning towards it being likely, even though I tend to remember my past as clear. I’m basing this on the fact that many people around me have reported being relatively slower compared to their younger selves, possibly due to age and circumstances. On the other hand, I know a few people who are older than I am and who seem to be accelerating, so there’s something to be said for that. A mix of both strategies seems to make sense. I can spend some time putting the infrastructure in place to do well during fuzzy times, and I can also take advantage of quick sprints to make things happen when I have a clear idea. When I’m sharp, that’s the time to lean in on health and systems and skills, the time to act on ideas and explore questions, the time to come up with lots of ideas and define tasks that I can do while fuzzy. It’s important to write, too, so that I can remember what it’s like to be sharp. When I’m fuzzy and don’t feel particularly like pushing, that’s a good time to focus on self-care and close relationships. It’s okay to relax, to observe, to explore. And there’s always the philosophical practice at being patient and dealing with challenges… It’s good. Hmm. What’s a good way for me to tell whether I’m under-preparing, over-preparing, or getting the balance right? If I under-prepare for fuzziness while I’m sharp, then when I’m fuzzy, I’m stuck with low-value activities like video games. This is okay, but with some thought, I might be able to tweak it to get more value. 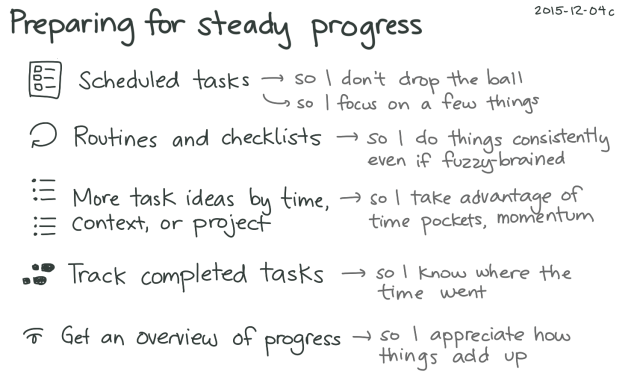 If I over-prepare for fuzziness while I’m sharp, then I’m missing the opportunity to build momentum and get stuff done. If I under-prepare for sharpness while I’m fuzzy, then when I’m sharp, I end up spinning my wheels or doing things that I could have done when I was fuzzy anyway. If I over-prepare for sharpness while I’m fuzzy, I might prolong my fuzziness or feel bleah. Hmm. It might be interesting to revisit my notes on the kinds of things I can do when I’m sharp and when I’m fuzzy (High energy and low energy activities). That might help me detect if I’m using my sharp time well. Also, it’s okay not to totally optimize this. =) I can be a little inefficient. You know how when you get going on something, you want to keep going? It’s a great feeling. You’re in the flow, you’re in the zone. Time passes unnoticed. 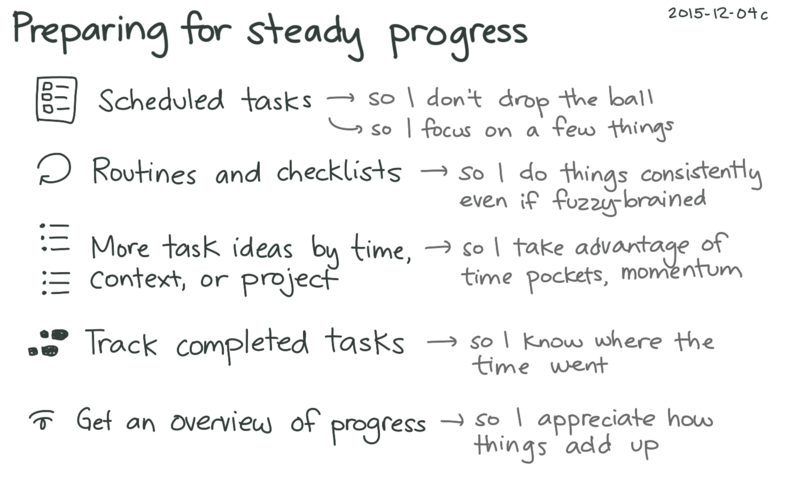 You’re getting stuff done. I don’t trust that feeling. At least not all the way. 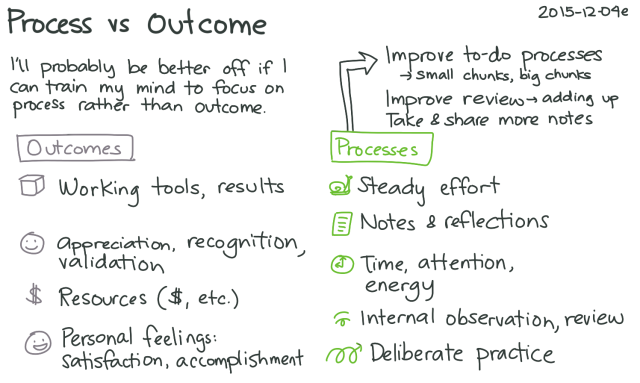 Here’s what got me thinking about this: I had just finished sketchnoting a book. It was fun. I felt accomplished. I wanted to do another sketchnote. In fact, I had already returned the previous book, picked another book from the shelf, and settled in for more drawing. Then I stopped and asked myself, Is this really what I should be doing next? 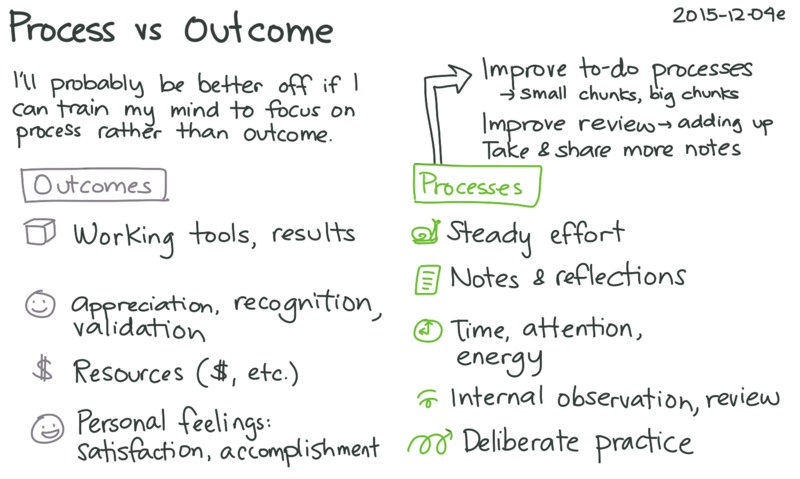 I was basking in the glow of people’s appreciation on Twitter and I already had all my tools set up for doing the next book, so it made sense to do another sketchnote. But was that really the best use of that moment? More of the same, or something else? I still stay up too late programming sometimes. I still spend hours reading. I still write my way past lunch, snapping out of the trance, suddenly starving, late in the afternoon. But I’m getting better at paying attention when part of me pipes up with weird questions. Am I at the point of diminishing returns or temporary saturation? It’s like the way that if you’re eating your favourite food, there’s a point after which you don’t enjoy it as much. Sometimes giving it a bit of a rest lets you appreciate it more. What could I be neglecting if I focus on this, both in terms of things I need to do and things I want to do? Am I better off spending time with W-, taking care of things around the house, or learning about things that don’t currently give me the same thrill? Is there value in letting this simmer and blend? I can crank out a lot of similar things quickly. Or I can give myself time to learn from people’s feedback and my reflections on process, so that I improve more with each step. Sometimes different things mixed together result in interesting flavours and textures, like the difference between a purée and a stew. It’s easy to do more, but what would enable me to do better? How can I step back and improve the infrastructure for future work? Infrastructure is not exciting, but it’s good to do. It helps to think about specific ways to make something better. What could better mean? With better chunking or flow? Sure, sometimes I’ll lose myself coding or writing or drawing. But sometimes it’s good to interrupt my momentum and ask: What’s important to do, even if it’s not currently as shiny or as fun as what I’m doing? Do you do this too? What have you learned? What questions do you ask yourself to help you decide what to do next?